Enhance your team's passing, shooting, and offensive execution with 15 development drills! The TCU basketball program has experienced an almost immediate turnaround upon hiring Jamie Dixon. The Horned Frogs won the NIT Championship in just their second season with Dixon at the helm. This is in large part due to the player development that has occurred over this time. In this video, you will see how Coach Dixon improves the offensive ability of his players through a collection of individual skill development drills. Coach Dixon spends an entire practice session training his players to make simple and effective decisions. Every drill has the purpose of training athletes to make the simple play or the right pass at the right time. This 'Open Practice' video provides you with an 'insider's view' of this valuable practice session - all focused on individual improvement! You will observe six passing and shooting drills that you can use with your entire team. Three passing drills will have your players refine their ability to make accurate passes, catch under control while on the move, pivot to find open passing windows, and finish around the rim. The Warrior and Maverick shooting drills will get your entire team competing against one another. Players will maximize the importance of every repetition when they know each shot matters to beat their teammates. Pre-Game Shooting will simulate scoring options in your transition offense with players catching on the move and utilizing fakes to gain an advantage for scoring at the rim or creating space for pull-up jump shots. Building complete guards is a top priority for Dixon. He demonstrates four competitive shooting drills that push his players to make good shots at game spots within their offensive system. You'll learn how to simulate transition jump shots, drive and kick situations, passing out of double teams to the open shooter, and setting up the defender to attack off ball screens. 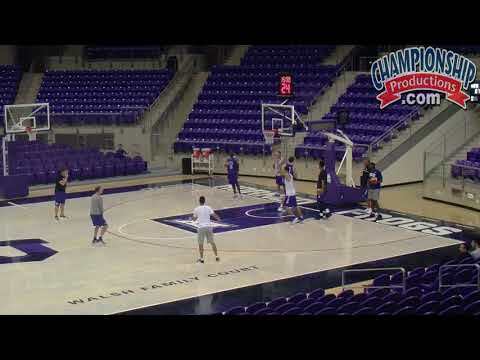 In TCU's pick & roll series, players are prepared for any pick & roll defense. Your athletes will be able to read what the defense is giving them and look for counters, gaps, and open shots. Coach Dixon gives you a wide-ranging workout that starts with teaching basic post stance and goes into pass fakes, finding the defense, and making a move to score. Post players have to be versatile and have good hands. Dixon has developed a post progress routine that makes sure every player has a go-to move, counter move, and another move in their arsenal, perfecting their footwork in the paint. Having Dixon comment on these drills and seeing Dixon's coaching first hand makes these particularly interesting to watch. Being versatile also means being able to score away from the basket. Players work on range from the free throw line and beyond. The Circle Shooting drill is the perfect way to develop touch around the rim while extending the range of your post players. Rounding out the post workout session, players develop their decision making skills coming off of a pick & roll. The Pick & Roll series will have your post players working through a progression of moves out of ball screens including short rolls, slips, pops, and more. From a pick & pop, to a roll, to a counter move in the paint, your post players will have a full range of moves and counters to be a complete post player. Improve your team's offense by enhancing the ability of every individual player on your roster with these skill development drills that are perfect for any program!